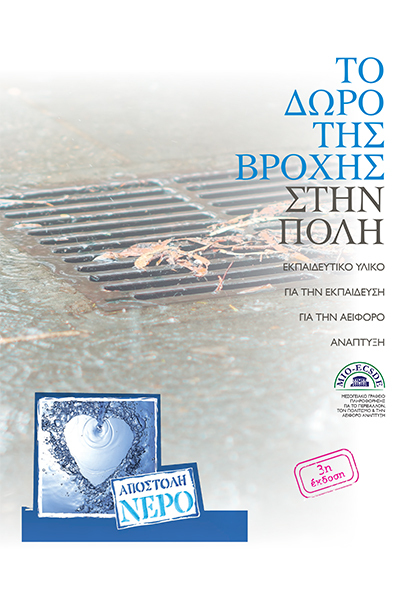 The educational material “The gift of rain” (produced in the Greek language) aims to raise awareness and educate students of late middle and secondary level (10-16 years old) towards the sustainable management of water. More specifically the material aims to cultivate in students the necessary skills to address the old, partly abandoned practices of rainwater collection, that have been traditionally applied in the Cyclades islands over the centuries, as well as the modern techniques that can be applied today in homes, hotels, etc. in order to collect, economise, or recycle water (through grey water reuse). Overall the material aims for students to acquire a positive attitude towards wise water use in their daily lives. The material could be a flexible tool for primary and secondary level teachers in the framework of Environmental Education (EE) and Education for Sustainable Development (ESD) working on related issues. “The gift of rain“ was developed within the framework of a pilot project conducted in the Cyclades Islands aiming at educating people of all ages towards a “new” (eventually not so new!) “water culture” necessary for addressing the current and future water scarcity challenges. The wider project was carried out in selected municipalities in the islands of Naxos, Syros and Tinos, with the financial support of the corporate social responsibility programme “Mission Water”. Since then the project has been expanded to many more Greek islands, Malta and Cyprus. “The gift of rain” and its 3 editions (2009, 2013, 2014) are available on www.medies.net in Greek.